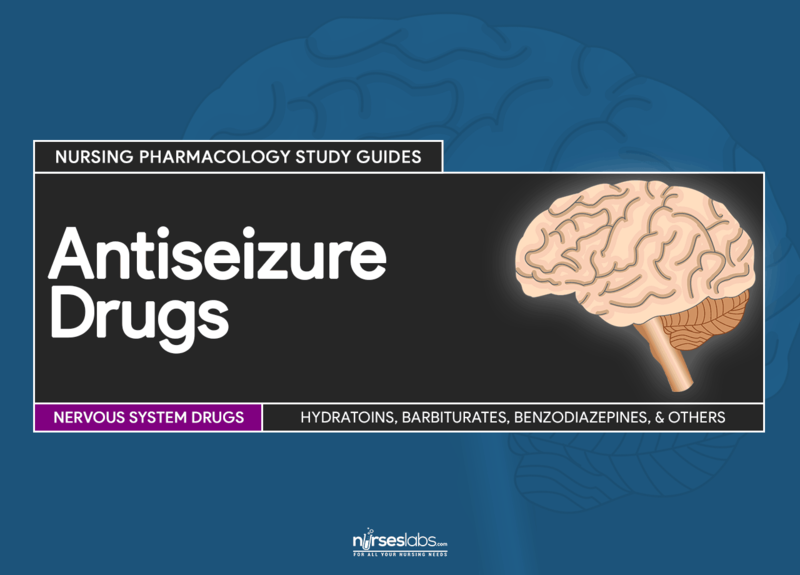 Antiseizure agents (also known as antiepileptic drugs or as anticonvulsants) are drugs used to manage epilepsy, the most prevalent neurological disorder. Antiseizure agents of choice depends on the type of epilepsy, age of the patient, patient tolerance, and specific patient characteristics. Nature of seizures depends on the location of the cells that initiate the electrical discharge as well as the neural pathways which were stimulated. Seizures can be primary (no underlying cause) or secondary (brought about by external factors like head injury). Status epilepticus is a state in which seizures rapidly recur with no recovery between seizures. It is potentially the most dangerous of seizures. It involves involuntary muscle contraction (tonic) followed by relaxation appearing as an aggressive spasm (clonic), loss of consciousness, and confusion and exhaustion in the early recovery period. It is an abrupt and brief (3-5 s) period of loss of consciousness common in children (starting at age 3) but frequently disappears by puberty. This seizure does not usually involve muscle contractions. It is characterized by short, sporadic periods of muscle contractions that last for several minutes. It is relatively rare. Self-limited seizure related to very high fevers and usually involves tonic-clonic seizures. This type most frequently occurs in children. Begins in one area of the brain and involve only one part of the body but this later on spread to other parts until a generalized tonic-clonic seizure has developed. It occurs in a single area of the brain and may involve a single muscle movement or sensory alteration. It is a type which occurs by late teenage years and involves a series of reactions or emotional changes and complex sensory changes (hallucinations, mental distortion, personality changes, loss of consciousness, and loss of social inhibition). Motor changes may include involuntary urination, chewing motions, and diarrhea. Drugs used for treatment of generalized seizures exert their therapeutic effects by blocking channels in the cell membrane or by altering their receptor sites. As a result, nerve membranes become stabilized. Their work involves the entire nervous system so sedation is an expected result. Drugs used to treat generalized seizures include hydantoins, barbiturates, barbiturate-like drugs, benzodiazepines, and succinimides. Succinimides and drugs that modulate the inhibitory GABA are used to treat absence seizures. Stabilize the CNS nerve membranes by decreasing the excitability and hyperexcitability of ionic channels in the cell membrane to stimulation. Decreasing the conduction through nerve pathways reduce the tonic-clonic, muscular, and emotional responses to stimulation. Less likely to cause sedation which makes them the drug of choice for patients who are not willing to tolerate sedation and drowsiness. They are more sensitive to the sedating effects of the drugs so frequent and close monitoring is required. Antiepileptic or antiseizure drugs can impact learning and social development. Parents of these children should receive consistent support and education about seizure disorder and medications. They should receive regular care and close monitoring for adverse effects. Adults taking this drugs are encouraged to wear MedicAlert identification during emergency instances. Education about the disorder, lifestyle changes, medications, and handling stigma should be given focus. Caution for use of these drugs to pregnant and lactating women is exercised because some medications are linked to fetal abnormalities in animal studies while some are clearly associated with predictable congenital effects in humans. Use of barrier contraception and alternative methods for feeding are encouraged. Stopping antiepileptic can precipitate seizures and would lead to anoxia. They are more susceptible to adverse effects of the drug because of possible problems in metabolism and excretion. There may be a need to reduce drug dosage. Pregnancy, lactation. Possible problems to the fetus or the newborn. Cellular toxicity is characterized by severe liver toxicity, bone marrow suppression, gingival hyperplasia, and serious dermatological reaction (e.g. hirsutism, Steven-Johnson syndrome). Inhibit impulse conduction in the ascending RAS, depress cerebral cortex, alter cerebral function, and depress motor nerve input. Similar with hydantoins, they are capable of stabilizing CNS nerve membranes by directly influencing the ionic channels in the cell membrane resulting to decreased excitability and hyperexcitability to stimulation. Phenobarbital depresses lower brainstem, cerebral cortex, and motor conduction. Aside for being used as treatment for tonic-clonic and absence seizures, mephobarbital is also used as an anxiolytic or hypnotic agent. Use of barrier contraception and alternative methods for feeding are encouraged. Stopping antiepileptic can precipitate seizures and would lead to anoxia. Mephobarbital is commonly associated with CNS and GI effects. It can also cause circulatory collapse and apnea which makes it less desirable compared to other antiseizure agents. Potentiate effects of GABA (inhibitory neurotransmitter that stabilizes nerve cell membranes). Act primarily in the limbic system and RAS so it can also cause muscle relaxation and relief of anxiety without substantially affecting the functions of the cortex. Used as adjunct to treatment of status epilepticus and severe recurrent convulsive seizures. Also used to manage epilepsy in patients who require intermittent use to control bouts of increased seizure activity. In addition to this, it can be used as agent to relieve anxiety before operative interventions. Act in inhibitory neuronal systems and suppress the electroencephalographic pattern associated with absence seizures. Adults taking these drugs are encouraged to wear MedicAlert identification during emergency instances. Ethosuximide has relatively few adverse effects compared with may antiseizure agents. Partial seizures can be either simple (single muscle or reaction) or complex (series of reactions or emotional changes). Drugs used to control partial seizures stabilize nerve membranes either by altering sodium and calcium channels or by increasing the activity of inhibitory neurotransmitter GABA. Carbamazepine inhibits polysynaptic responses and blocks sodium channels to prevent formation of repetitive action potentials. It is chemically related to TCAs. Clorazepate and felbamate potentiate the effects of GABA. Gabapentin blocks polysynaptic responses and stimulus increases in certain situations. Carbamazepine, felbamate, and oxcarbazepine are used as monotherapy. The remaining drugs are used as adjunctive therapy. Bone marrow suppression. Exacerbated by drug effects. Pregabalin is a category V controlled substance (can cause feelings of well-being and euphoria). It is also related to CNS depression characterized by somnolence, dizziness, and visual changes. Assess for mentioned contraindications and cautions (e.g. drug allergy, diabetes, hepatorenal dysfunction, arrhythmias, hypotension, etc.) to prevent untoward complications. Assess for the description (onset, aura, duration, recovery) of seizures to determine type of seizure and establish a baseline. Perform a thorough physical assessment (skin color and lesions, vital signs, level of orientation, affect, reflexes, bowel sounds, urine output, etc.) to obtain baseline data and monitor changes associated with adverse effects. Monitor results of laboratory tests (renal and liver function) to determine appropriateness of therapy and possibility of dose adjustment. Monitor for adverse effects and provide appropriate supportive care as needed to help patient cope with these effects. Monitor CBC results to detect bone marrow suppression early and provide prompt intervention. Discontinue the drug at any sign of hypersensitivity reaction, liver dysfunction, and severe skin rash to limit reaction and prevent potentially serious reactions. Provide comfort measures (e.g. positioning of legs and arms for dyskinesia, sugarless candy and ice chips for dry mouth, voiding before taking drugs for urinary hesitancy or retention, etc.) to help patient tolerate drug effects. Monitor patient response to therapy (decrease in incidence or absence of seizures). Monitor for adverse effects (e.g. CNS changes, GI depression, bone marrow suppression, severe dermatological reactions, liver toxicity, etc). Quiz time! Here are 5 questions about this topic: Antiseizure Agents. It is a rare type of seizure that appears sporadically. Which antiseizure agents is used to treat absence seizures? Succinimides and drugs that modulate the inhibitory GABA are used to treat absence seizures. All of them treat generalized seizures but it is succinimides that are particularly indicated for absence seizures. A patient on Dilantin began showing bruises and signs of active infection. The nurse would be right to anticipate that these manifestations give clue to ________________. It is characterized by severe liver toxicity, bone marrow suppression, gingival hyperplasia, and serious dermatological reaction (e.g. hirsutism, Steven-Johnson syndrome). Which barbiturate is also indicated for management of anxiety? Benzodiazepines exert their effect primarily on which neurotransmitter? It potentiates effects of GABA, an inhibitory neurotransmitter that stabilizes nerve cell membrane. Muscle relaxation is one result. 1. It is a rare type of seizure that appears sporadically. 2. Which antiseizure agents is used to treat absence seizures? 3. A patient on Dilantin began showing bruises and signs of active infection. The nurse would be right to anticipate that these manifestations give clue to ________________. 4. Which barbiturate is also indicated for management of anxiety? 5. Benzodiazepines exert their effect primarily on which neurotransmitter? 1. Answer: B. Myoclonic seizure. 3. Answer: C. Cellular toxicity. Not bad – however please make sure your research is current in this area. One of your barbiturates is no longer available – it has been discontinued. Phenobarbital is able to be given daily, so it is active in the system for > 24 hours. Also, some of your drug classifications aren’t correct. The most up to date anticonvulsant drug list is available at epilepsy.com. The Epilepsy Foundation makes certain the information they provide is up to date – used them all through my early adult years and still do. They don’t have the classifications available, but those are easy even from a resource such as drugs.com who provides the PDR drug information. Epilepsy Foundation’s website also has the most up to date terminology used in relation to seizure types. Jacksonian isn’t even used anymore. You missed Ativan – our emergency benzodiazepine for status epilepticus. You totally missed Depakote (sodium valproate), Keppra, Lamictal, and Lyrica to name a few others that are more common than Zarontin, Celontin, and Zonegran – depending on where you are anyway. Trying not to be overly critical – but if you really are into research – please make sure it is correct before you publish. As I said, not only am I a “patient” with the above condition for these medication classes, but I have been a nurse for 10 years now. While my resources may not be that scholarly – think AJN, NEJM, etc; they are more reliable than google.com. Thank you.